It appears that the Samsung Galaxy View 2 release could take place in the coming months. It’s the successor to the original Galaxy View that Samsung launched in 2015. The Galaxy View was a 18.4-inch “movable display” that was neither a tablet nor a conventional display. It was something in between. According to a recent report, Samsung has a successor to the Galaxy View in the pipeline. The company hasn’t said anything about the Samsung Galaxy View 2 release yet but the device has picked up two key certifications. This can be taken as an indication of an impending launch. The Galaxy View 2 bearing model number SM-T927A has received its Wi-Fi and Bluetooth certifications. According to the previous report, the new Galaxy View will have a slightly smaller 17.5-inch display with an integrated book-like hinge that lets the device stand in two different configurations. The open configuration would make the screen stand upright like a notebook while the closed configuration will have it at a 30 degree angle similar to a drafting desk. The original Galaxy View had a handle which allowed users to carry it around like they would a shopping bag. That has reportedly not made the cut for the successor. So it’s possible that the new device could be carried around like a laptop once the hinge is closed. Details about the Galaxy View 2’s specs are slim but it’s said to feature an Exynos processor with 3GB of RAM and Full HD display resolution. It will be running Android 8.0 Oreo out of the box. The Bluetooth certification confirms that the device will have support for Bluetooth 5.0. 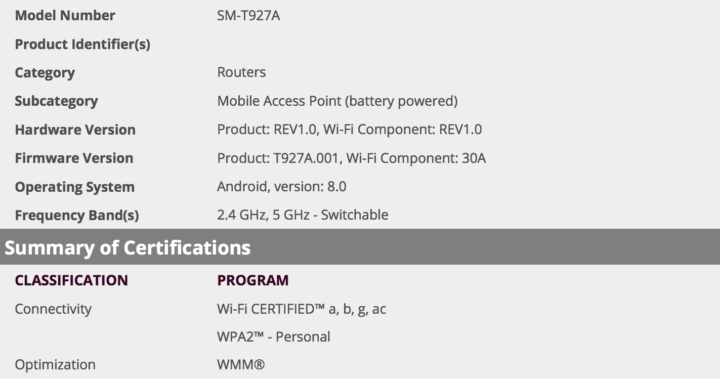 It has also obtained the Wi-Fi certification which confirms support for 802.11 b/g/n ac with 2.4GHz and 5GHz frequencies. As far as the launch is concerned, the Galaxy View 2 may be launched on AT&T in the United States first. Samsung hasn’t commented on any reports concerning the Galaxy View 2 at this point in time. Sometimes I don’t understand Samsung…. For the Tablet and the Galaxy View they should launch 1 model every 2 years and with the TOP specs! Not like what happened this year for the Tab S4… I kwwp the table for 3/4 years… if you launch it with old specs already, I’m not willing to buy…. but android tablets does not have better apps in market – thats a main problem for android tablets. I use a ipad – i find few(i wish more and more productive apps) very good apps there. I would purchase it if it supports and comes with S Pen and has worthy specs – SD 845, 6 or 8gb of RAM and 256gb of internal storage. Your expectation is beyond reality, the Tab S4 doesn’t even come with that specs. LOL same goes for so many people!! people still expecting phones to come with IR blasters and removable batteries!! Ridiculous people. I think that samsung need to keep something for the future. They can’t release all tech they have now.